When it comes to coffee drinking, I’m a lightweight. Between a temperamental stomach and nerves that kickback 12 hours post-sip, it’s better that coffee and I enjoy each other in small installments. Costa Rica produces some of the best liquid caffeine in the world, though. So I feel obligated do my part and drink in the delicious culture. At the local Chinese import store, I found some sweet little cups that are a great fit for my dainty joe capacity. But filled with compassion for friends who come over for cafecito, I also bought an extra-grande mug—the kind you instinctively hold with two hands. Seeing them hang side by side like David and Goliath makes me smile. And gets me thinking. For some things, small cups can be a blessing. It’s good to have limits on what can turn from a blessing into a curse if taken in the wrong quantities. Cheetos, for example. Or television. Perhaps shopping purchases. Fill in your own blank. 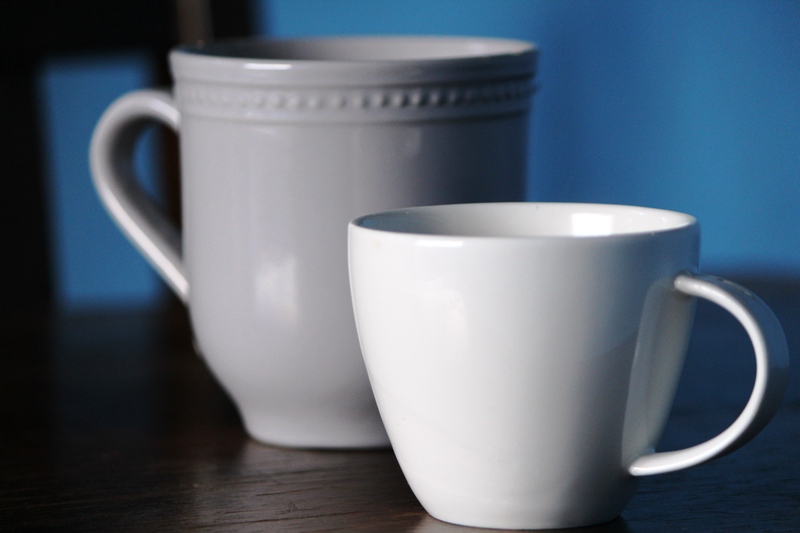 Small cups can help us keep things in perspective. But what size cup do I have offered up to the Lord? I confess that sometimes in this busy season I feel full with a shot of devotion reading before classes, a squirt of bible time during lunch, and a measure of family prayers at bedtime. Or maybe it’s just my day that feels full. My heart definitely isn’t. The schedule holds out a dainty espresso cup while my spirit sighs over the slosh in the bottom of the empty decanter. And I’m reminded again that if I get everything done, but have not love, I gain nothing. Flawless Spanish + Balanced Checkbook + Clean House – Love = 0. I don’t know how to walk this out perfectly, but I’m going to keep trying. I’m going to pay attention to my empty places and invite the Lord in to fill them. I’m going to make space to be with Him and trust for His grace over the rest of the To Do List. I stand before you, busted by my own sentences. One of the fullest weeks yet has just drawn to a close. We did all kinds of assignments, spent half a day in the bureaucratic jungle to get our Costa Rican driver’s licenses, and shared a bible story (with a minimum of 23 required grammar elements) in 20 minutes of Spanish for a language exam. Lots of boxes successfully checked. But even as I chatted about idiomatic phrases with the friendly faces on my language route, I knew I was running on empty. Thank goodness for the new mercy of this morning. Praise God that He is a well that never runs dry. I hold up my cup again, and He is ready to fill it. When it comes to relationship with Jesus, I want the extra-grande. This entry was posted in Costa Rica, Day by Day, Kris' Heart and tagged burn out, caffeine, coffee, Costa Rica, cups, Isaiah 30, Jesus, limits, making space, perspective, running dry, to-do list. Bookmark the permalink. I will also need one of the small dainty coffee cups when I come down to visit you! Thank you Lord for never forgetting us, even when we don’t always remember to think of you. Yes and Amen to both of those, Cheryl! Missing our fireside tea chats and sending all our love. I NEEDED this post. So thankful for a God who speaks to me through my beautiful friend. I want my cup to overflow again, and I have taken the big cup, but only filled it a tiny bit as if that is the same. ” What have I rendered to the Lord, for all His benefits to me? I have offered the sacrifice of thanksgiving, and have called on the name of the Lord….. ” Time to drink up. Thank you, Chris. I’m right there with you. Cheers, Friend! Love, love, love this post! I am so glad we serve a God who does not standing there checking boxes on my “performance”, but so available and ready to fill me when I come running for an extra-grande cup full! As always, you inspire and bless my heart! :) love you all and lifting your family regularly before His throne! You are so right, Sharon! And we are so thankful for your awesome family inspiring us right back. Blessings from Costa Rica! You are all awsome. Coffee or not. I try to pray for you at least once a day. I am very proud of you. I know life can get tedious, but just remember i Omaha tonight it will be 3-4 degrees below zero and the high tomorrow is supposed to be 11 degrees above zero. That is better than last week. It is keeping me very busy. I did get all of today off. and that was a blessing. It is getting late but I wanted to let you know I am thinking of you. You have no idea how much that means to us, Jim! Thank you so much for your encouragement and standing behind us, not to mention lighting your prayer furnace on our behalf. 🙂 Glad you had some time to rest today. Much love and many blessings from all of us!